From wine to chewing gum stains on your carpet can be your enemy. Here are some handy hits on removing some common carpet stains. Alcoholic beverages: Quickly dilute the spot with cold water. Absorb the excess liquid. Then mix 1 teaspoon mild detergent, 1 teaspoon white vinegar, and 1 Litre warm water. Apply the solution to the spot, and let the carpet dry. Vacuum gently. Blood: Absorb as much of the blood as you can. Then mix 1 teaspoon mild detergent, 1 teaspoon white vinegar, and 1 Litre warm water. Apply the solution to the spot, and let dry. Apply dry-cleaning fluid. Vacuum gently after the carpet is dry. Chocolate: Immediately scrape the chocolate from the carpet. Mix 1 teaspoon mild detergent, 1 teaspoon white vinegar, and 1 Litre warm water. Apply the solution to the spot. Rinse well. Vacuum gently. Coffee: Blot spilled coffee immediately. Then mix 1 teaspoon mild detergent,1 teaspoon white vinegar, and 1 Litre warm water. Apply the solution to the spot, and let dry. Apply dry-cleaning fluid. Vacuum gently after the carpet is dry. Crayon: Scrape away excess crayon or remove it by placing a blotter over the crayon stain and pressing it with a warm iron until the blotter absorbs the melted crayon. Move the blotter frequently so that it doesn’t get oversaturated. Apply dry-cleaning fluid, and let the carpet dry. Vacuum gently. Fruit: Fruit stains can be very hard to remove if they are allowed to set, but if you act quickly this method usually prevents a permanent stain. Scrape up spilled fruit, and absorb fruit juice. Mix 1 teaspoon mild detergent, 1 teaspoon white vinegar, and 1 Litre warm water. Apply the solution to the spot, and let the carpet dry. If the spot remains, repeat the procedure. Vacuum gently. Gravy: Wipe up as much of the spilled gravy as possible. Mix 1 teaspoon mild detergent, 1 teaspoon white vinegar, and 1 Litre warm water. Apply the solution to the spot. Let the carpet dry. Apply dry-cleaning fluid, and let the carpet dry. Vacuum. Mud: Allow the mud to dry completely and then brush or scrape off as much as possible. Mix 1 teaspoon mild detergent, 1 teaspoon white vinegar, and 1 Litre warm water. Apply the solution to the spot. Let the carpet dry. 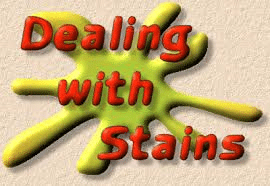 If the stain remains, apply dry-cleaning fluid and blot dry. When the spot is completely dry, vacuum gently. Salad dressing: Absorb as much salad dressing as you can. Mix 1 teaspoon mild detergent, 1 teaspoon white vinegar, and 1 Litre warm water. Apply the solution to the spot. Let the carpet dry. If the spot remains, repeat the procedure. Vacuum gently. Soft drinks: The carbonation in soft drinks will help you clean spilled drinks quickly, but act fast because some of the dyes in the drinks can permanently stain your carpet. Blot up the spilled drink. Mix 1 teaspoon mild detergent, 1 teaspoon white vinegar, and 1 Litre warm water. Apply the solution to the spot. Let the carpet dry. If the spot remains, repeat the procedure. Vacuum gently. Urine: Mix 1 teaspoon mild detergent, 1 teaspoon white vinegar, and 1 Litre warm water. Apply the solution to the spot. Let the carpet dry. If the spot remains, repeat the procedure. Vacuum gently. Vomit: Treat vomit quickly. Blot up as much as possible, then dilute immediately with baking soda and water or with club soda. Apply a solution of 1 part ammonia and 10 parts water. Rinse with cold water, let dry, and then vacuum. Wine: When red wine is spilled on your carpet, dilute it with white wine, then clean the spot with cold water and cover with table salt. Wait ten minutes, then vacuum up the salt. When nothing seems to work or your time poor why not give us a call ! !